sister projects: Wikipedia article, Commons gallery, Commons category, quotes, news, textbook, Wikidata item. This index lists case decisions published by the Supreme Court of the United States organized chronologically. See also the category United States Supreme Court decisions and List of United States Supreme Court cases on Wikipedia. To browse by author see category US Supreme Court Justices. 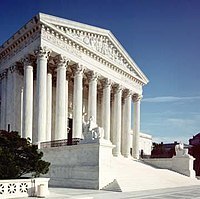 This page is part of a WikiProject to improve the United States Supreme Court case pages. To participate see the project page. Supreme Court Building in Washington, D.C.
293 U.S. 15 (1934) Commonwealth of Virginia v. Imperial Coal Sales Co.
293 U.S. 102 (1934) Rowley v. Chicago & Northwestern Railroad Co.
293 U.S. 121 (1934) Helvering v. Morgan's Inc.
293 U.S. 140 (1934) City of Waco Tex v. United States Fidelity & Guaranty Co.
293 U.S. 172 (1934) Zellerbach Paper Co. v. Helvering National Paper Products Co.
293 U.S. 183 (1934) National Paper Products Co. v. Helvering Zellerbach Paper Co.
293 U.S. 191 (1934) Helvering v. Northern Coal Co.
293 U.S. 268 (1934) Indiana Farmer's Guide Publishing Co. v. Prairie Farmer Publishing Co.
293 U.S. 282 (1934) Helvering v. Union Pacific Railroad Co.
293 U.S. 307 (1934) Irving Trust Co. v. A. W. Perry, Inc.
293 U.S. 328 (1934) Davis v. Aetna Acceptance Co.
293 U.S. 351 (1934) McLaughlin v. Pacific Lumber Co.
293 U.S. 357 (1934) Marine Natational Exchange Bank of Milwaukee v. Kaltzimmers Manufacturing Co.
293 U.S. 377 (1934) George v. Victor Talking Mach Co.
293 U.S. 379 (1934) Enelow v. New York Life Ins. Co.
293 U.S. 386 (1935) Adamos v. New York Life Ins. Co.
293 U.S. 454 (1935) United States v. Baltimore & Ohio Railroad Co.
334 U.S. 182 (1948) United States v. Paramount Pictures, Inc.
383 U.S. 1 (1966) Graham v. John Deere Co.
458 U.S. 419 (1982) Loretto v. Teleprompter Manhattan CATV Corp.
464 U.S. 417 (1984) Sony Corp. of America v. Universal City Studios, Inc.
469 U.S. 325 (1985) New Jersey v. T.L.O. 550 U.S. 398 (2007) KSR International Co. v. Teleflex Inc.
550 U.S. 618 (2007) Ledbetter v. Goodyear Tire & Rubber Co.
569 U. S. ____ (2013) Bowman v. Monsanto Co.
576 U. S. ____ (2015) Obergefell et al. v. Hodges, Director, Ohio Department of Health, et al. This page was last edited on 13 July 2018, at 21:13.